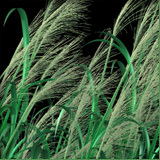 OnyxGRASS is the first ever dedicated parametric modeler for grasses. 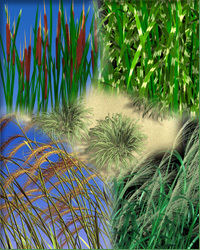 The modeler creates a wide variety of decorative grasses, wild grasses, and grass covers and it comes with the library of ready-to-use grasses and grass covers. As is the case with all our modelers, this modeler has a well structured, intuitive interface, easy to understand and especially so by all those who are visually inclined. With hundreds of parameters carefully structured around the principal grass elements, the modeler gives the user unprecedented control and enables easy creation of a wide variety of decorative grasses, wild grasses, and grass covers. New features are: 3D terrain import and spreading grass over that surface, expanded cross modeling of cylindrical grass elements, cross modeling of florets, multi-material option for modeling leaves, modeling caps option on cylindrical elements, maximum lengths and widths are increased, there are additional fractional value sliders, line drawing option, mouse wheel feature, uninterrupted drawing, offscreen drawing option, set exact main window size, and 64-bit addressing. OnyxGRASS creates: (1) decorative grasses with or without their flowering parts; (2) wild grasses both, individual or in groves; (3) wheat grasses used as grain crops both, individual or in groves; (4) cattail and other wetland grasses both, individual or in groves; and (5) a variety of low grass bunches that may serve as "fillers" around trees, shrubs, and flower beds. OnyxGRASS Library that comes with the package contains representative samples of grasses from the above mentioned selections. And the Tutorials that come with the package will teach you how to create your own grasses from the above mentioned selections. OnyxGRASS creates grass covers. 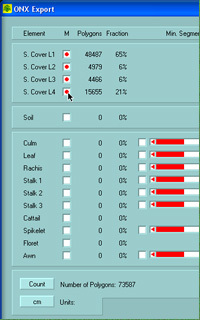 By specifying the grass cover's (1) form, e.g. rectangle, circle, oval, (2) size, and (3) growth habit, you can create a wide variety of covers which will suit the requirements of your scenes perfectly. 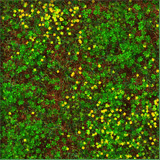 OnyxGRASS Library that comes with the package contains representative samples of grass covers. And the Tutorials that come with the package will teach you how to create your own grass covers. OnyxGRASS is a procedural modeler. This means that the computer does the modeling by following the procedures that are built into the software. The procedural modeling is extremely fast and enables the creation of most complex 3D objects which otherwise could not be built. The user controls the modeling process via parameters which are, in effect, 3D object descriptors. Parameters are indispensable part of any procedural modeler. The choice and number of parameters affects greatly the quality and range of modeled objects. 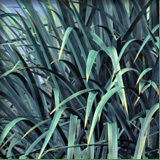 OnyxGRASS has numerous parameters on your disposal. These parameters control the lengths, widths, angles, curvatures, and many other attributes of principal grass elements. By adjusting different parameters, you can change the topological and geometrical characteristics of particular grass and affect its polygonal count. OnyxGRASS 2 can import 3D terrain as OBJ file and spread grass over that surface. Such grass area can be exported out as 3D object to fit the original terrain. See the movies below. All the available parameters in OnyxGRASS, and there are hundreds of them, are carefully structured in logical groups so that you can navigate through without ever getting lost. Extremely well thought-out user interface makes you feel in control at all times. The Tutorials that come with the package will help you get a good grasp of the interface logic. And, this will be all you need to start creating your own grasses with confidence. OnyxGRASS has a Help bar at the bottom of the main window which displays functional description of each and every interface control, e.g. slider, check box, button. If you need an explanation for a particular parameter, for example, you will position the mouse on the corresponding parameter button and the description will appear on the Help bar. You will find the Help bar very convenient and effective for getting information when needed, and much more efficient than referencing the manual would be. OnyxGRASS has a proprietary rendering engine developed by Onyx Computing to, specifically, suit the requirements of procedural modeling. Firstly, procedural modeling is fast, so it needs fast rendering engine. In addition, interfacing with the procedural modeler requires fluidity which can only be accomplished in a non RAM-dependent modeling environment. Therefore, procedural modeling is non RAM-dependent modeling and it requires non RAM-dependent rendering. Most of today's rendering engines operate on 3D object data that sits in RAM, i.e. renderers are RAM-dependent which means: the larger the data, the bigger the RAM requirements. Such RAM dependency can lead you into troubles when rendering complex scenes. OnyxGRASS rendering engine, on the other hand, is non RAM-dependent which means that it can render an object of any size without ever increasing RAM requirements. So, when rendering in OnyxGRASS, you do not have to ever think about RAM, all you need to think about is the grass you are set to create. 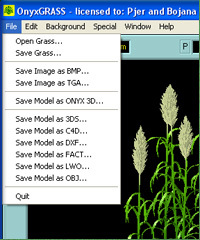 OnyxGRASS exports 3D models in the above file formats. 3DS is Autodesk 3D Studio file format that has been around for some time and has been accepted as one of the standard 3D file formats for the industry. Besides Autodesk's 3D Studio MAX, many modeling, rendering, and animation packages support 3DS. C4D is Cinema 4D file format. DXF is Autodesk AutoCAD file format that has been regarded as the industry standard for ages. It is hard to find a CAD, modeling, or rendering package that does not support DXF. FAC and LWO are Electricimage and Lightwave file formats respectively. OBJ is Wavefront file format that is supported by Maya. All these files carry 3D geometry and color, and all except DXF carry UV mapping coordinates. ONX file is a proprietary Onyx Computing 3D file format which we have developed to suit the needs of our modelers. OnyxGRASS is the first in the series that supports ONX file. The others will follow. At this time, the only 3D rendering and animation package that reads ONX files is 3D Studio MAX. In order for you to take the full advantage of ONX export, you need to have our Onyx2Max plugin which enables the import of ONX files into 3D Studio MAX. The advantages of importing our vegetation to 3D Studio MAX as ONX files via ONYX2MAX plugin are immense. Besides carrying 3D geometry and UV mapping coordinates, ONX file carries color-per-vertex data and material data including the textures which can be applied to different grass parts in OnyxGRASS. So, when importing a grass as ONX file to 3D studio MAX, you do not have to spend extra time to set the materials as is the case with 3DS file. ONX file delivers 3D object that is render ready. 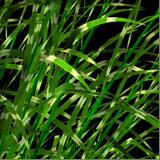 OnyxGRASS exports rendered grass image as a BMP or TGA file. This can come handy if you have some decorative or wild grasses in the background and you wish to save on polygons by substituting 3D models with, so called, billboard (or panel) grasses. 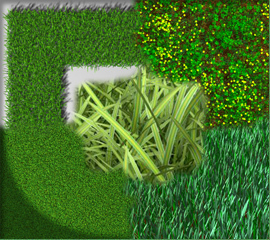 Billboard grasses are, in effect, one polygon panels texture mapped with the grass image. 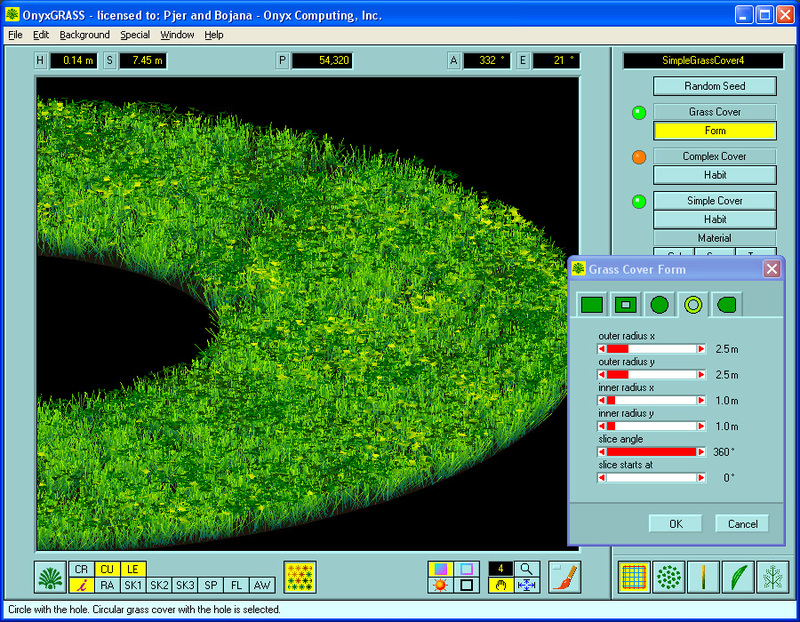 OnyxGRASS delivers both, the grass image and the matching panel. You may also be interested in exporting grass cover as an image to be texture mapped over ground surface. Or, use grass images in your photo composition work. Each image saved as a BMP file is accompanied by additional BMP file which carries alpha channel data for that image. 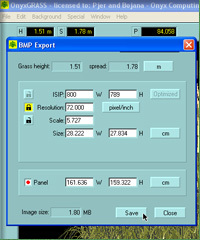 The BMP file limits image resolution to no more than 1280x1024 pixels. Each TGA file contains the image and the alpha channel data for that image. The TGA files allow image resolution of up to 30000x30000 pixels. OnyxGRASS comes with tutorials that cover pretty much all aspects of the software. The tutorials will teach you how to create your own grasses and grass covers, how to apply the color or texture to grass parts, how to lower the number of polygons on a particular grass, and how to export grass image as a BMP or TGA file. As you are following step-by-step tutorial instructions, you will get a good grasp of the user interface logic which will be all you need to start using the software with ease. And the complementary diagrams with all the grass parts will give you necessary botanical knowledge to start creating your own grasses with confidence. 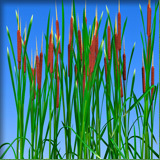 OnyxGRASS comes with OnyxGRASS Library - a collection of already created grasses ready to use, modify, and expand upon. The grasses are shown below. What you see on the images is what you get, including texture-maps where applicable. Click on the caption to see a larger image. Calamagrostis2 Carex o.E. Cattail Cyperus alt. Cyperus pap. Elymus can. Mischantus Gig. Mischantus Sin. Molinia cae. 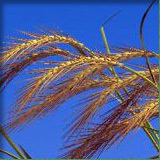 Pennisetum s.
Download a zip file containing OnyxGRASS application, plant libraries, tutorials, and auxiliary files.